Symmetric bridle with soft padded, detachable headpiece with four Velcro closures. The cheekpieces and the noseband are adjustable at the top of the headpiece. The throatlash and the noseband are adjustable with a buckle at the bottom. As a result, there are no visible buckles on the side of the horse's head. The bridle has a round stitched browband with a split headpiece. The bridle will be delivered with an extra browband. This curved browband features studs, a chain with imitation diamonds and soft leather lining. Like the standard browband, this extra browband has a split headpiece. 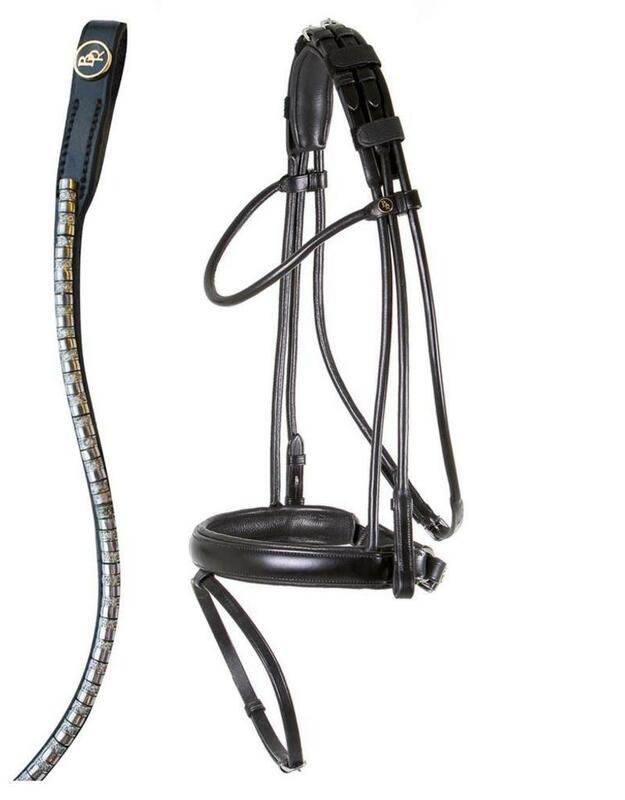 The wide (± 3.5 cm) crank flash noseband is round raised, soft lined and has a wide chin pad with soft padded lining. The browband, noseband, throatlash and the cheekpieces have been made of round stitched leather. The bridle features hook stud billets and round, shiny silver-coloured fittings. Supplied without reins.